California court rejects concept of "binding mediation"
Posted on June 5, 2006 | Comments Off on California court rejects concept of "binding mediation"
J. Craig Williams over at May It Please the Court discusses the details of a recent California state appellate court decision which rejected the concept of “binding mediation” in a stipulation for settlement between two parties. Williams sets forth the differences between arbitration and mediation as a prelude for the discussion of the court opinion which follows. Read Craig’s article first, then see the court opinion (in PDF). If binding mediation is to be recognized, what rules apply? 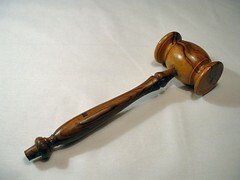 The arbitration rules, the court-ordered mediation rules, the mediation confidentiality rules, or some mix? If only some rules, how is one to chose? Should the trial court take evidence on the parties’ intent or understanding in each case? A case-by-case determination that authorizes a “create your own alternate dispute resolution” regime would impose a significant burden on appellate courts to create a body of law on what can and cannot be done, injecting more complexity and litigation into a process aimed at less. Thanks for this link goes to this week’s edition of Blawg Review, the weekly review of the best in law blogging, hosted by the fearsome Professor Kingsfield.